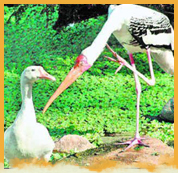 There are several sanctuaries in India but Nawabganj Bird Sanctuary holds a special place amongst them! The exotic beauty and rejuvenating ambience at Nawabganj is simply out of this world. And that is why people from far come here in huge numbers to experience such blissful spirits! Nawabganj is bestowed with enriched wildlife and lush greenery! The magnificent ambience available here, makes perfect home for more than 250 species of local and migratory birds! In addition, here you get to see some of the rare plants and faunas as well. Here you get to see several exclusive species of birds that are not elsewhere seen in other parts of the nation. Birds like Shoveller, Pochard, Parakeet, Woodpecker, Coot, Common Teal and Purple Moorhen are the prime attractions of the sanctuary! Peacock, Spotwill, Painted Stork, Sarus crane, Dabchick, White Ibis, Open billed stork, Whistling teal, Bronze winged Jacana, Pheasant tailed jacana, White necked stork, Pigeon, Tern vulture, Lapwing, bee eater and Indian roller! Several migratory birds come from Russia and its neighboring parts in the specific seasons. The best thing about the birds at the sanctuary is that they are available in plenty and aren't shy that means you can easily see them! Nawabganj is one of the luckiest sanctuaries that have such enormous range of wildlife creatures. The park has got rare species of deer that is called Hangul in the local dialects. In addition, you get to see here numerous species of reptiles like Vipers, Cobra, Karait (Local species of snake), water snakes and rat-snakes! Also, Kavai, Saul, Sindhi, Katla, and Mangur are some of the prominent species of fishes available in the lake of the sanctuary! Nawabganj bird sanctuary is well connected with all the means of transportations. Cabs, taxis, buses are available on all the weekdays and weekends. In addition, it is very proximate (around 45 kiloemeters away) to the Lucknow-Kanpur highway! At this moment we don't have any specific Tour package for Nawabgang Bird Sanctuary, but our representative would be happy to assist you if you are planning to visit Nawabgang Bird Sanctuary you can contact us with your query on the given phone numbers / email. Nawabganj Bird Sanctuary is home to more than 250 species of migratory and water birds. These birds come from as far as Europe and Siberia, traveling a distance of around 5000 kilometers every year. The Sanctuary is a paradise for photography enthusiasts. Sarus crane, Graylag Goose, painted stork, white necked stork, open billed stork, black ibis, white breasted water hen, white ibis, golden oriole, Red Crested Pochard, Gadwall, dove, pheasant tailed jacana, dabchick, Pintail, whistling teal, cormorant darter, pigeon, king crow, spoon bill, black necked stork, vulture, kite, bronze winged jacana, Indian moorhen, grebe, babbler, parakeet, purple moorhen, koel, egret, bee eater, peacock, comb duck, lapwing and finch are some migratory and resident birds which can find easily in the sanctuary. The sanctuary is also a Bird Interpretation Center, which gives knowledge about birds and their behavior in detail. Location	: Nawabganj, Unnao District, Uttar Pradesh, India. By Air	: The nearest airport is at Amausi, Lucknow, 45 kms. By Rail	: Kusumbi Junction is only 02 Kms from Sanctuary. By Road	: The sanctuary is located on National Highway No. 25, 45 kms. Both from Lucknow and Kanpur.